TreeSize Professional is a powerful and flexible hard disk space manager for Windows . Native 64 Bit support makes sure that available memory will never pose a restriction – not even on the largest systems. 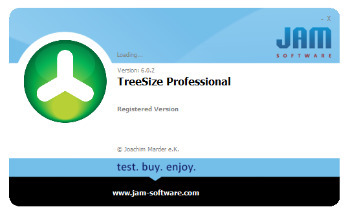 From Windows Vista/Server 2008 onwards TreeSize provides a ribbon user interface. You can print detailed reports and charts or export the collected data to many different formats such as XML, XLS, TXT, CSV and many more. Compare XML reports or take shapshots of your disk space usage to track its development over time. The application has an intuitive Explorer-like user interface and supports drag and drop operations. It is fast, multi-threaded, and supports Unicode- and NTFS-specific features. TreeSize Professional can be started from the context menu of every folder or drive. Bugfix: Imported XML reports are no longer missing “Expand” symbols. Bugfix: When reading an XML report with multiple scans, the scans are now shown again grouped. The progress shown while reading reports has been improved. Bugfix: MSI Installer: The property “ALLUSERS” has a valid value again. Bugfix: We now avoid a potential delay when TreeSize is started “as administrator” and cannot connect to a mapped network drive. Bugfix: The default Excel export file path, that can be adjusted in the Options dialog, is now memorized again. Bugfix: If a printed report contained some compressed items printed in blue, all following items were also printed in blue. This is no longer the case. Bugfix: File Search: Sorting by the column “Dir level” is significantly faster now. Bugfix: File Search Personal Edition: The “Add” Button in the dialog “Checkmark if…” is no longer disabled.